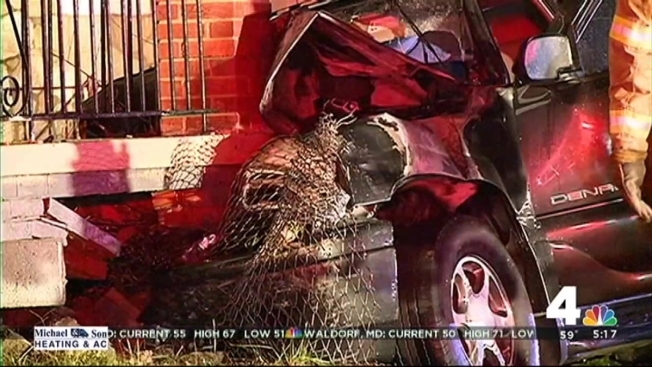 Two people suffered serious injuries after the SUV they were riding in crashed into a house in Fairmount Heights, Maryland, early Monday morning. Prince George's County police say the SUV was speeding when the driver lost control in the area of Addison Road and Dunbar Oaks Drive about 2:30 a.m. The SUV drove onto a curb, crashed through a fence and slammed into the front porch of a home. The vehicle then caught fire. Five people were inside the SUV at the time of the crash; two were transported to an area hospital with minor injuries. One person is in critical condition while the other suffered serious injuries, said Mark Brady, a spokesman for the Prince George's County Fire Department. A family of four sleeping inside the home was not injured. The home's front porch and columns suffered significant damage.